About Australians for Animals Inc.
Australians for Animals Inc (AFA) was founded in l989 by former Fairfax investigative journalist, Sue Arnold, together with a small group of talented and motivated people who care deeply for animals and the environment. AFA is an incorporated association and a NSW registered charity. All campaigns are run with the support of an informal Advisory Board of highly skilled scientists, and lawyers who advise, review and guide the campaigns of the charity. Our Management Committee made a decision, all those years ago, that AFA would always remain a grass roots organisation, reflecting the importance of community and the amazing ability of dedicated people to make a difference. That the charity would work within community, aware that it takes more than a village to save wildlife populations and the environment. AFA has made its mark internationally and nationally. In the 90’s, AFA made history as the first Australian group to have an animal listed under the US Endangered Species Act. 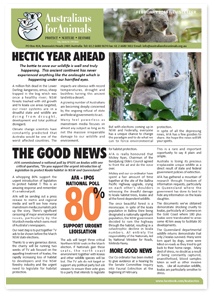 Eight years of dedicated research resulted in the Koala being listed as Threatened. In the good old days, this listing would have gone a long way to protecting the Koala and its habitat. Unfortunately, unparalleled greed and rejection of environmental concerns by governments, corporations and the resource industries, not only in Australia but world-wide over the last decade, have ensured that laws to protect wildlife and the environment are proving ineffective. AFA is an International Whaling Commission NGO, although the charity believes the meetings are, these days, an expensive waste of time as Free Trade issues ensure that trade sanctions are no longer available as a weapon against delinquent whaling nations. AFA has considerable expertise on underwater noise issues and the charity has focused on noise in the marine environment with the support and advice of leading bio-acousticians. In the US, AFA has run a number of lawsuits to protect the California Gray Whale from damaging noise experiments to refine the military Low Frequency Active Sonar (LFAS). In the European Parliament, AFA played a major role in ensuring a moratorium on LFAS. Six years ago, AFA founded the California Gray Whale Coalition as no major US conservation organisations had the Gray Whale as its focus. The Coalition is now the largest whale conservation coalition on the west coast of North America with member organisations from Mexico, Canada, Alaska and the US. AFA is now focused on protecting the Great Barrier Reef World Heritage Area and in particular, highlighting the appalling management of the Gladstone LNG development which is a template for all resource exploitation around the Australian continent. Two years ago, we set up a blog on the Reef at: www.greatbarrierreef.org.au This blog is an attempt to overcome the mainstream media shutdown on the catastrophic decline and mortality of dugongs, inshore dolphins, and turtles who are the victims of the developments. AFA respects Mother Earth and her magnificent gifts of life which are deserving of the best efforts of every human to ensure that future generations, human and non-human survive in a healthy environment.